Kismet World Wide Consulting is a globally distributed team of consultants. We aim to provide products and services that make the world a better place for everyone and we strive to make sure all of our work meets and promotes our Corporate Principles. Kismet World Wide Honored at U.S. White House as a "Champion of Change"
Kismet World Wide Consulting performed technical analysis and wrote the technical reports detailing just how scary the privacy risks are of popular mobile health and fitness apps, along with a HOW TO for developers detailing how to do privacy right. The work was performed for Privacy Rights Clearinghouse (https://privacyrights.org), funded by a grant from the California Consumer Protection Foundation. Privacy Rights Clearinghouse Releases Study: Mobile Health and Fitness Apps: What Are the Privacy Risks? What are your mobile apps revealing about you? How can you protect yourself online? In 2015 Kismet World Wide Consulting gave presentations at the Crypto-Thon! event hosted by the EFF and Wikimedia, at the Oslo Freedom Forum, and at the r00tz Asylum event at DEF CON describing the privacy and security risks of using mobile apps, how to identify who your mobile apps are talking to and what they are revealing about you, and how to protect yourself online. This work was sponsored by The Wickr Foundation, a global initiative focused on building the Private Web by advancing private communication and uncensored information. Your mobile apps: Who are they really talking to? What are they revealing about you? How can you find out? How can you protect yourself online? Stories, pictures, and a FAQ from Lie's service as a United States Peace Corps Volunteer in West Africa including information about Lie's work building the country's first Bachelor's in Computer Science major at The University of The Gambia, solar costing and installation information, and a brain dump on the state of technology in The Gambia in 2005. BeeLine Reader and BeeLine for Education makes reading faster and easier by using a color gradient that guides your eyes from the end of one line to the beginning of the next. We helped BeeLine add functionality to the BeeLine family of iOS apps to provide text coloring to Kindle eBooks and many popular websites on your iPhone and iPad. BeeLine is especially helpful for those with reading problems including those diagnosed with ADHD, dyslexia, or a learning disability. Ever wonder if you can really change the world? You can with WasteNot! Use WasteNot to make the Earth a better, greener place to live. Find and share good ideas that can reduce your waste and your impact on the environment, then watch to see how big of a difference you and your ideas can really make! 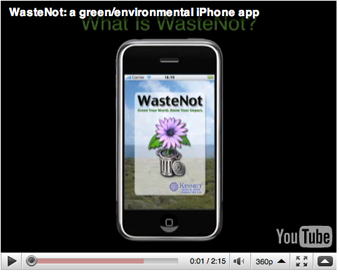 WasteNot was built on iOS 2, released in 2010, and ran on all versions of iOS without a single code change until iOS 9. An update to iOS 9 currently in progress. A few articles we wrote during the iOS 2.x days about our experience developing WasteNot.